Family & friends are invited to attend a Memorial Visitation on Saturday, March 30th from 12:00 p.m. to 2:00 p.m., in the Vertuccio and Smith, Home for Funerals, 773 Broadway (Route 107) Revere for Janice T. (Paterna) Webber, who died on Friday, March 15th at the Milford Regional Medical Center in Milford, following a long illness with ovarian cancer. She just celebrated her 70th birthday on February 9th. A Funeral Service will take place in the funeral home, following the visitation, at 2:15 p.m.
Janice was born & raised in East Boston and she was an alumna of Fitton High School, Class of 1966. After graduation, Janice worked in health care services as a Pharmacy Technician. She began her long career at Chartwell, later taking a position at Apria Health, which is now Coram Health. She loved her work and did it for over 30 years until she retired in 2015. Janice was married to her soul mate, Ronald Webber in September of 1970. The couple lived in Walpole then later settling in Millis. She had a deep affection & love for all animals but most significant were horses. She also loved her New England Patriots. She was a super fan and never missed a game. She is the cherished wife of Ronald J. Webber of Millis. Devoted daughter of the late Anthony & Theresa (Tennerini) Paterna. Loving sister of Maria A. D’Amico of Lancaster, New Hampshire. Adored aunt of Maria Cummings & her husband Robert. Dear grand-aunt of Tayla M. Cummings, Robert A. Cummings & Hannah E. Cummings, all of Lancaster, New Hampshire. Interment will be private. Saturday, March 30th from 12:00 p.m. to 2:00 p.m. In lieu of flowers remembrances may be made to the Animal Rescue League of Boston, Dedham Branch, 55 Anna’s Place, Dedham, MA 02026. Family & friends are invited to attend the Visitation on Friday, March 22nd in the Vertuccio & Smith, Home for Funerals, 773 Broadway (Route 107) REVERE, from 9:00 a.m. – 11:00 a.m., for Mary Jo (Powers) Belmonte, who passed unexpectedly on Sunday, March 17th at the Melrose-Wakefield Hospital, Melrose. 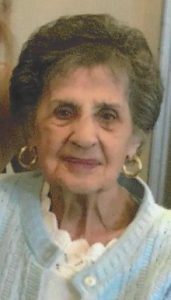 Her Funeral Service will be conducted in the funeral home following the visitation at 11:15 a.m. and immediately followed by interment in Woodlawn Cemetery, Everett. Born, raised & educated in East Boston, she attended East Boston schools & was an alumna of East Boston High School, Class of 1952. 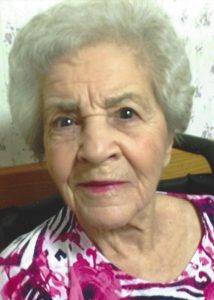 She came to live in Revere over sixty years ago. For over 20 years, she was employed by the Revere School System, as a Lead Cafeteria Worker serving the Revere High School & the Lincoln School, from whence she retired. She had a long & pleasant relationship with the St. Anthony of Padua Parish Community. She was a member of the Anthonian Club. She was also active with the Ladies’ Auxiliary of the Mottollo Post #4524 in Revere as a long-time member and volunteer with special events & functions. Her late husband, Arthur E. Belmonte, passed on, January 3rd, 2004. She is the beloved mother of Arthur E. Belmonte Jr. & his wife, Christine of Charlton and the cherished grandmother to Adam Belmonte & his wife, Evie of Andover, Joseph, Kyle, Brian and Maya Belmonte, all of Charlton. She is the dear sister of Claire DeBow of California & the late Phyllis Stanford. She is also lovingly survived by her sister-in-law, Jennie Belmonte of Revere & many nieces, nephews, grandnieces & grandnephews. Friday, March 22nd from 9:00 a.m. to 11:00 a.m. In lieu of flowers, remembrances may be made to the Winthrop PACE Center (Patient Activities Fund) 10 Gove St., East Boston, MA 02128. 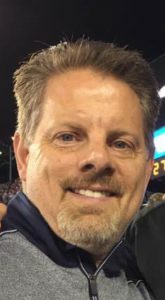 Family & friends are invited to attend Visiting Hours on Wednesday, March 20th from 4:00 p.m. to 8:00 p.m., in the Vertuccio & Smith, Home for Funerals, 773 Broadway (Route 107) REVERE for Mitchell C. Tobin, who lost his intense struggle with metastatic cancer for over four years, on Sunday, March 17th at Boston’s Brigham & Women’s Hospital. His funeral will be conducted from the funeral home on Thursday, March 21st at 10:00 a.m., followed by the Funeral Mass in St. Anthony of Padua Church, 250 Revere St. REVERE, at 11:00 a.m., and immediately followed by interment at Woodlawn Cemetery, Everett. Born & raised in Warren, Ohio, he spent eight & half years as a Veteran of the U.S. Navy. His commendations, medals & decorations are many. He is the recipient of the Expert Pistol Shot Metal, Sea Service Deployment Ribbon (2), National Defense Service Medal, Southwest Asia Service Medal, Navy “E” Ribbon, Navy Unit Commendation, Kuwait Liberation Medal & the Joint Service Achievement Medal. He was discharged as an Operations Specialist, 2nd Class. He came to Boston in 1998 & graduated from Northeastern University, Class of 2000. After his marriage to his devoted, Josephine M. (Filiti) Tobin in August of 2001, they lived in Revere for a short time, before moving to West Peabody. Until last fall, he was still doing what he loved most, after his family, working as a Registered Civil Engineer for J.F White Construction Co., a position he has held for over 20 years. His hobbies and recreations were intense, such as an overwhelming for the game of golf & bowling. He is the faithful & beloved husband of 18 years to Josephine M. (Filiti) Tobin. Adored father to Joseph Michael & Anthony Simone Tobin, both at home. Cherished son-in-law of Simone “Sam” & Filippa A. “Phyllis” Filiti & dear brother-in-law to Rosario S. Filiti, all of Revere. Devoted son of Anita C. Tobin-Drummond of Warren, OH & the late Michael J. “Mickey” Vucinich & the late Inez Vucinich. He is also lovingly survived by a sister & brother. Wednesday, March 20th from 4:00 p.m. to 8:00 p.m. In lieu of flowers, remembrances may be made to Dana Farber Cancer Institute, Division of Development & the Jimmy Fund, P.O. Box 849168, Boston, MA 02284-9168. 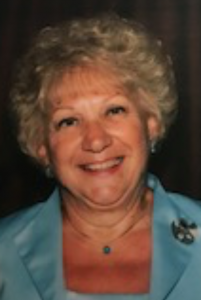 Family & friends are invited to attend Visiting Hours on Thursday, March 14th in the Vertuccio and Smith, Home for Funerals, 773 Broadway (Route 107) REVERE from 4:00 p.m. to 8:00 p.m. for Virginia M. (Russo) Forgione, who passed after a brief illness on Sunday, March 10th at Care One at Essex Park Rehabilitation and Skilled Nursing of Beverly. She was born in Winchester almost one hundred years ago on September 22, 1919. 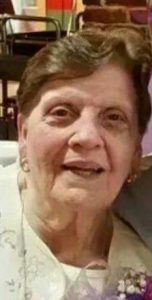 Her funeral will be conducted from the funeral home on Friday, March 15th at 10:00 a.m., followed by a Funeral Mass in St. Anthony of Padua Church, 250 Revere St., Revere at 11:00 a.m. and immediately followed by interment at Calvary Cemetery, Winchester. Mrs. Forgione was a Packer for the former “Cool Ray Inc.” of Chelsea for over 30 years. She spent most of her adult life in Chelsea on Carroll St., before moving to the Victory Gardens of East Boston. Her joy was time with her family and a luncheon date or early supper date with her family. Her beloved late husband, George J. Forgione, Sr., passed on April 21st, 1993. She is the cherished mother of George J. Forgione, Jr. & his wife, Janet of Boxford & Joan F. DeNapoli & her husband, Paul R. DeNapoli. She is the devoted grandmother to Kristina E. Forgione &her husband, Fahd Cynndy of Saudi Arabia & Korinne G. Bryant & her husband, Kyle Bryant of New Hampshire. She was the dear sister of the late Victor Russo & his late wife, Louise Russo & the late James Russo. She is also lovingly survived by her four great grandchildren, Faris, Tariq, Ziyad & Brody. A fifth great grandchild is due in May and eagerly anticipated. Several nieces & nephews also survive Virginia. Virginia also belonged to the Chelsea Senior Center, where she enjoyed many a social functions. Thursday, March 14th from 4:00 p.m. to 8:00 p.m.
Family & friends are invited to attend Visiting Hours on Saturday, March 9th, from 9:00 a.m. to 11:00 a.m., in the Vertuccio & Smith, Home for Funerals, 773 Broadway (Rte. 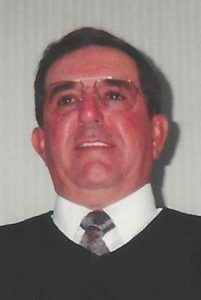 107) REVERE for Frank A. Roselli, Sr., who passed following a yearlong battle with metastatic lung disease at his Plymouth residence on Monday, March 4th. His funeral will be conducted from the funeral home on Saturday, March 9th at 11:15 a.m. & immediately followed by entombment at Holy Cross Community Mausoleum, Malden. Born at Winthrop Community Hospital, the family lived the early years at the Eagle Hill Section of East Boston. Later, Frank would move with his family to Charlestown & then onto Sharon & Andover. For the past twenty years, he has lived in Plymouth with his beloved wife of 20 years, Deborah J. D’Agresta-Roselli. He was educated within the Boston School System and he attended Boston Trade School. Most of his working career was proudly taken as a Master Carpenter & Craftsman, for Local #40 Carpenters Union & he often worked as a self-employed developer. Concurrently, he worked often as a Tractor Trailer Driver for Local #25, especially in the food industry for Stop & Shop, Inc. and other food markets. 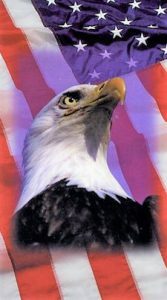 He served the U.S. Army during peacetime, from September 17, 1956 thru September 16, 1959, as a SP4, E-4 (T). His hobbies were many and varied, i.e., fishing, boating, camping, and was most proud of his talents as an unofficial “Chef”. He enjoyed working around the house and spending time at home with his wife Debbie and his puppy Misha. Frank is the devoted father to Frank A. Roselli, Jr. & his wife, Virginia of North Attleboro & Tracey Roselli of Wareham. He is the cherished grandfather of Gregory Roselli & his wife, Morgan of Attleboro and Samantha A. Roselli of North Attleboro. He is the dear brother of Corinne Roselli of Melrose & the proud uncle to Anthony Pisani of Hull & Mandi Hogan of Revere. He is also lovingly survived by his canine buddy, “Misha” and many faithful cousins. Saturday, March 9th from at 9:00 a.m. to 11:00 a.m. In lieu of flowers, remembrances may be made to Cranberry Hospice, 36 Cordage Park Cir., Suite 326, Plymouth, MA 02360 or by visiting www.bidplymouth.org. Family & friends are invited to attend Visiting Hours on Wednesday, March 6th from 4:00 p.m. to 8:00 p.m. in the Vertuccio & Smith, Home for Funerals, 773 Broadway (Route 107) for Frances R. (Fedele) Borick, who passed unexpectedly on Saturday, March 2nd after being taken to Melrose-Wakefield Hospital. Her funeral will be conducted from the funeral home on Thursday, March 7th at 9:30 a.m., followed by a Funeral Mass in the Immaculate Conception Church (Corner of Beach St. & Winthrop Ave.) REVERE at 10:30 a.m. and immediately followed by interment at Woodlawn Cemetery, Everett. Born & raised in Revere, she was educated in the Revere school system and was a 1942 alumna of Revere High School. 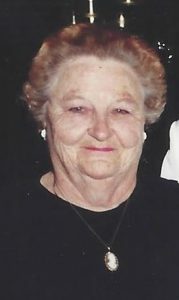 She and her family lived in Revere until building her new home in 1962 in Saugus, where she remained until her passing. Her beloved late husband Arthur J. Borick, Sr. passed on May 18, 2000. She is the cherished mother to Arthur J. Borick, Jr. of Saugus & the devoted grandmother to Matthew A. & Kyle R. Borick, both of Saugus. She is the sister of the late Cosmo J. Fedele & the late Marie E. Molinari & Ann T. Fedele. She is also lovingly survived by many nieces, nephews, grandnieces & grandnephews. “Franny” was the epitome of devotion to her family, not only her immediate family, but to all of her extended family. She was a marvelous chef and homemaker. Wednesday, March 6th from 4:00 p.m. to 8:00 p.m.
Family & friends are invited to attend Visiting Hours in the Vertuccio & Smith, Home for Funerals, 773 Broadway (Route 107) REVERE on Saturday, March 2nd beginning at 9:00 a.m. for Frederick P. Garrity, who passed following a long confinement at the Pope Nursing Home of Weymouth on Thursday, February 28th. 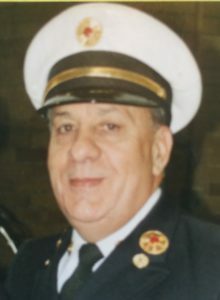 A funeral will be conducted from the funeral home on Saturday, following the visitation, with a Funeral Mass to be celebrated at 11:00 a.m. in St. Michael the Archangel Chapel (on the campus of the Chelsea Soldiers’ Horne) 91 Crest Ave., and immediately followed by interment in Holy Cross Cemetery, Malden. Born & raised in the Powder Horn Hill Section of Chelsea and an alumnus of Chelsea High School, Class of 1958, he entered the U.S. Navy in January of 1959, during the Vietnam Era & served until December of 1962 as a Seaman 3rd Class. For over thirty-five (35) years, Frederick was stationed at the Deer Island Site as an Engineer 1st Class, retiring in 2004. He was also a long-time member of the American Legion Post #61 of Revere. He is the beloved son of the late John A. & Margaret (Foley) Garrity. He is the cherished brother to Mary A. Harrington & her late husband, Paul J. Harrington of Marshfield & the late John G. & Edward G. Garrity. He is also lovingly survived by his faithful cousin, Gerald “Jerry” Foley & his wife, Dorothy F. (Kirby) Foley of Revere, several other cousins, many nieces, nephews, grandnieces & grandnephews. He was also the brother-in-law to the late Anne & Eleanor Garrity. Saturday, March 2nd from 9:00 a.m. to 10:30 a.m. In lieu of flowers, remembrances may be made to the Patients Activities Account at Chelsea Soldiers Home, 91 Crest Ave., Chelsea, MA 02150.